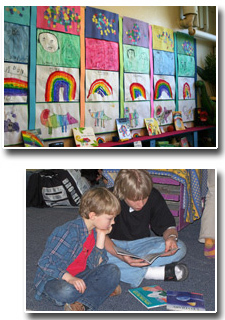 Cobblestone School began as a collaboration of three women: Margaret Forbes, Martha Herrick, and Lynne Kliman, who were the co-founders, co-directors, and co-teachers for the first three years. Doug Noble was a co-founder and was involved in early organizational efforts. In 1983, Cobblestone opened its doors to 28 students, 5 of whom were children of the co-directors. Eventually, two of the original co-founders moved on, leaving Lynne Kliman in charge until 1996, when Rose Martin (the first teacher hired by the original co-directors) became the school's fourth Director. During her tenure, Cobblestone expanded to include a Middle School. Rich Duff was hired on staff to help develop the Middle School and later became the fifth Director when Rose retired. He served from 2004 to 2006. Former Cobblestone teacher Paula Wooters became the Director of the School after having taught Primary grades for eleven years and served until 2009. In 2009, Lisa Kindig, a parent, took the position of Director through May 2011, when her family decided to move out of state. After Lisa’s departure, Rose Martin re-joined Cobblestone and is our current Director. Parent, student and staff support and Board of Trustees’ oversight serve to strengthen Cobblestone’s History and Future within the Rochester community. Cobblestone began with a meeting in Margaret Forbes' living room attended by a handful of parents and has grown steadily ever since. The school's first location was a room in the basement of the Immanuel Baptist Church on Park Avenue in Rochester. As enrollment grew, Cobblestone expanded into the rest of the church basement, and then onto the building's third floor. By 1989, Cobblestone had outgrown this space. A group of older students moved into the third floor of the current Prince Street location. One and one half years later, the rest of the school followed, moving into the first and second floors. In 1992, Cobblestone purchased the building at 10 Prince Street and the three acres of land on which it sits. Over the years, Cobblestone has been involved with local universities and colleges by providing placements for student teachers and professional development workshops for experienced teachers. The Director and staff collaborate with other school districts to provide workshops on interdisciplinary curriculum, whole language and assessments. Additionally the staff conducts presentations at a variety of conferences in the area. The Director and staff are frequent attendees at conferences to update their teaching practices. Guided by its philosophy, Cobblestone has worked to remain a viable alternative to the more traditional educational programs available in Rochester. Cobblestone offers students and teachers the opportunity to become involved in their own learning and growth.